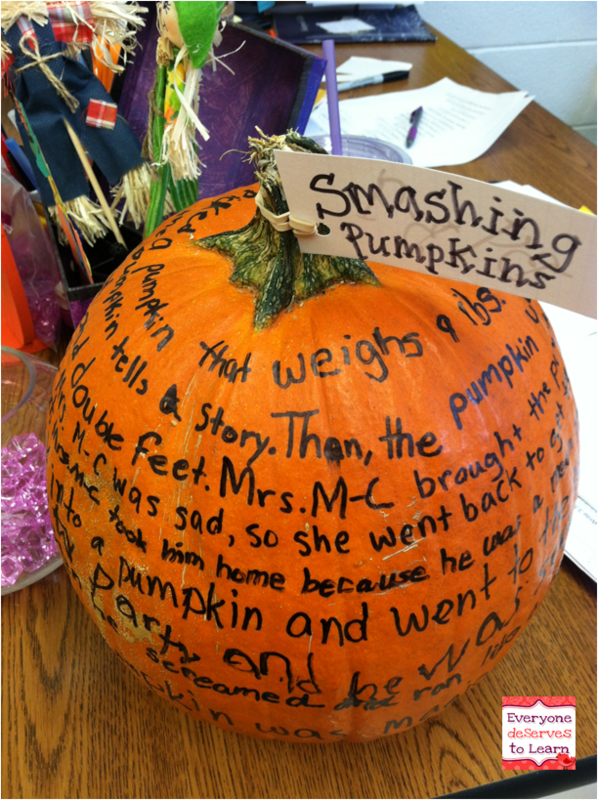 No, we're not actually smashing pumpkins! 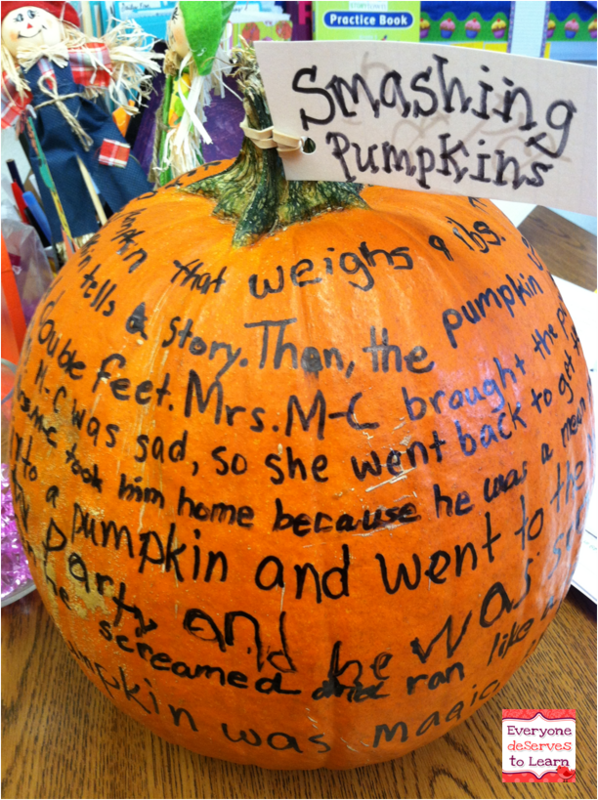 That's just the title my students came up with for our collaborative-story pumpkin. The cool thing about using a pumpkin as a vehicle for our story was the motor development practice it gave them. 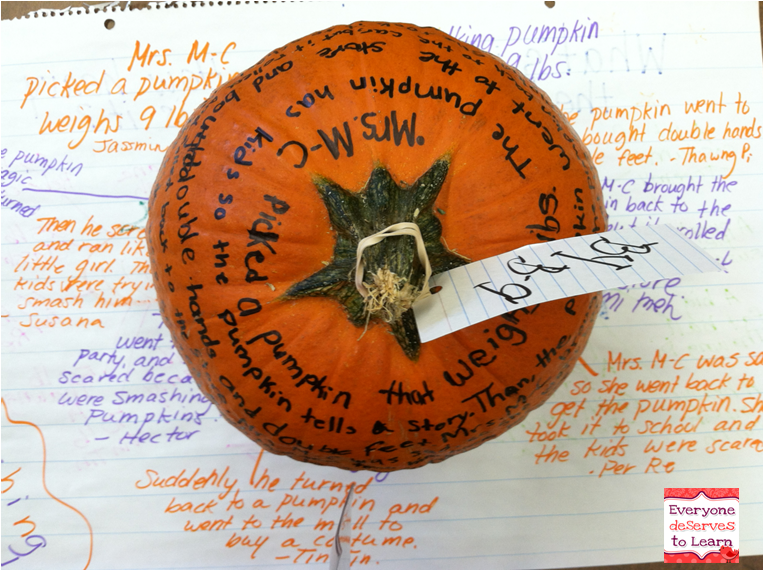 It's hard to write on a pumpkin! I traced a straight line with chalk for some of my students who really needed help, but I think they did a pretty good job with their handwriting, bumps and lumps and all! They were so proud of their pumpkin, and it sat on my desk practically until Christmas. Not a pumpkin fan? 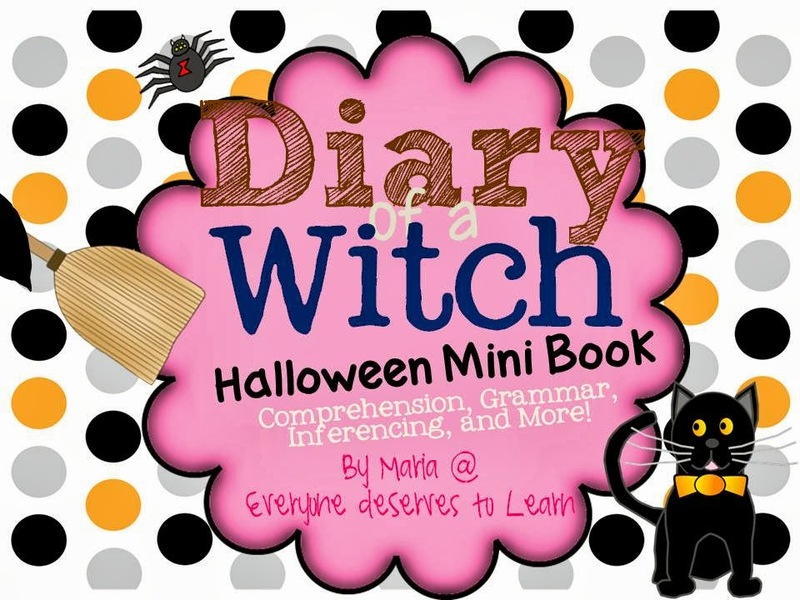 Here are some of my other favorite fall resources. 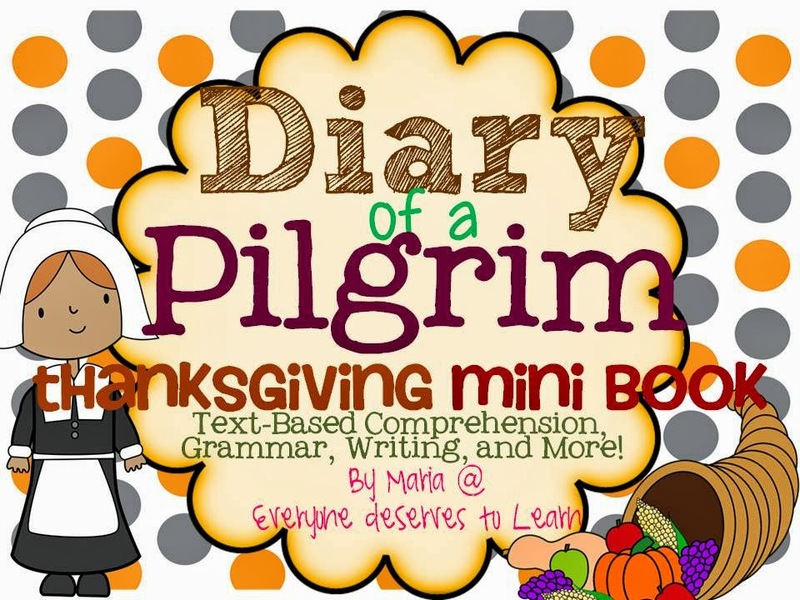 Click any picture to go to my TPT store and check them out! What are your favorite things about fall? Mine are hot apple cider, scarves, and boots. 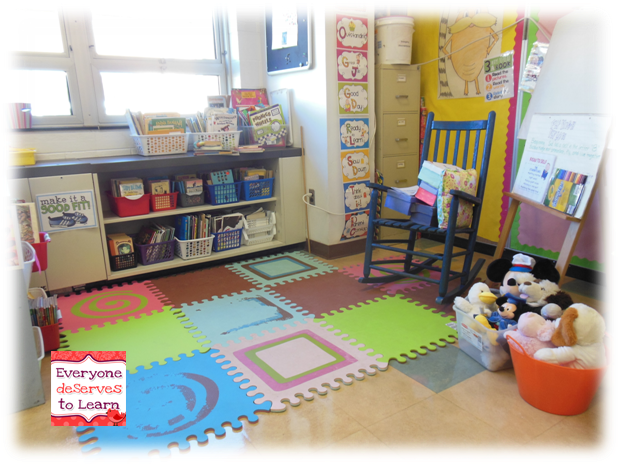 Teaching Newcomers: Our Class Routine and Freebies! 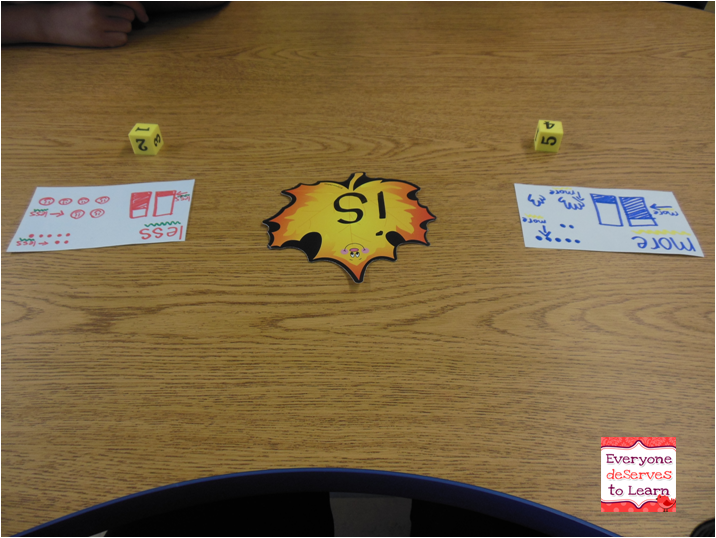 My newcomers have been hard at work practicing their numbers, letters, and sounds. I'd love to show you what we've been working on! 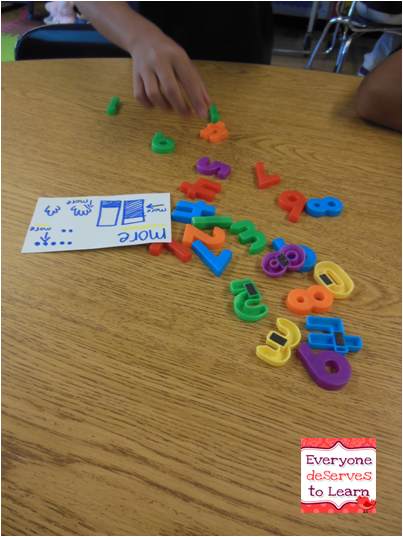 We start every class with a review of our alphabet; sometimes we use flashcards, sometimes we use a chart, and sometimes we use this great video from Have Fun Teaching. Next we practice greetings. I have them do an entrance "password" to get in the room, but I reinforce greetings with their favorite Youtube video (it's catchy!). Next up we work on emotions. We use this video, which I screen-shot(ted) into a powerpoint to use as a teaching tool. 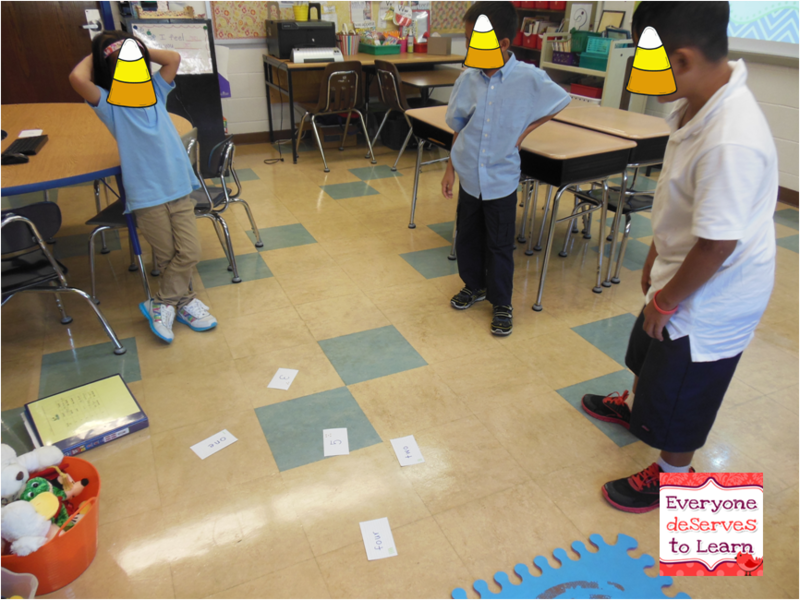 At the end of our first 40 minutes, we work on consonant sounds using Wilson Fundations cards. Right now we're just working on consonant sounds- vowels will come eventually. In Burmese/Karen/Karenni, /n/ /g/ /h/ and /l/ don't really exist at the end of a word so we are working on those sounds as well as others like /x/ that are really hard to wrap our teeth around. 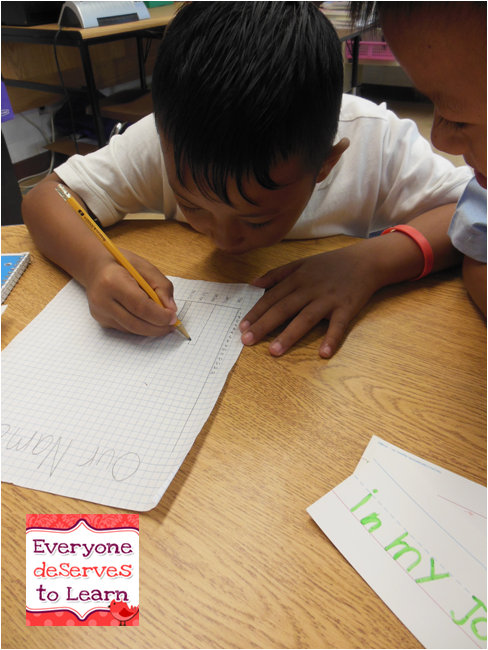 After we work on greetings, letters, and emotions, we turn to math. I've started a Number of the Day routine with them with some awesome freebies (see below), which I'm really loving. Granted, we're only on day 2, but I think it will really improve their number sense! 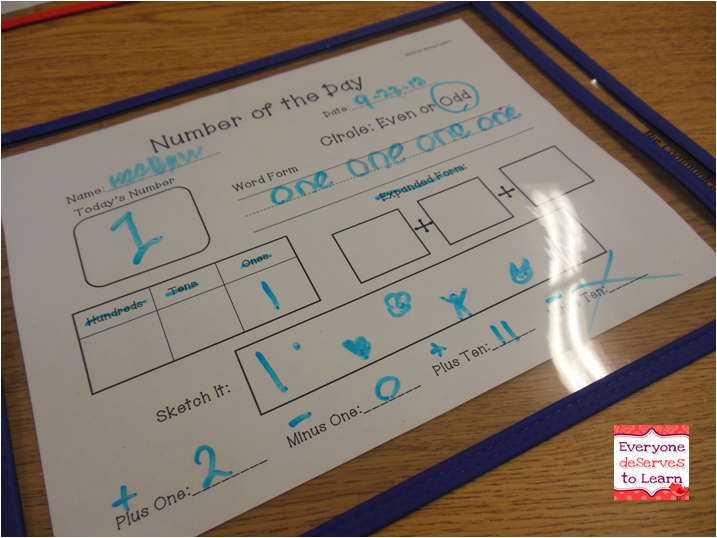 Once we're done with our number of the day, we move on to a math lesson, such as more or less. I started more or less last week before my students were ready (I do that a lot...I get too excited about teaching! ), but I persevered and I'm glad I did- it has helped to teach them the words plus and minus, and will help me in the long run to teach them greater than, less than, and comparatives (wayyy down the road). 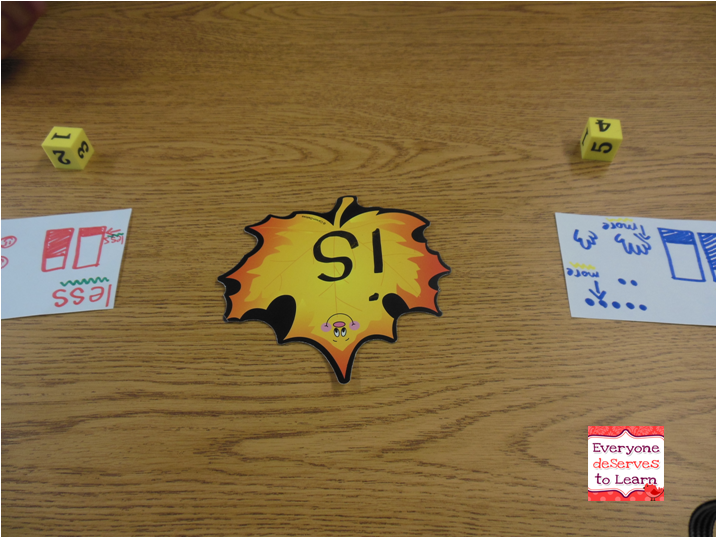 I made up two cards with the words and matching visuals, which we used with various manipulatives, realia, people, etc all week. Towards the end of last week, after lots of practice and repetition, they began to understand the relationship between bigger numbers and more blocks, taller stacks, and me standing on the table. You do what you have to do. Eventually, I had them roll two numbers or use the magnetic numbers and show me which one was more/less. In some cases they pulled the more/less card to them, and in some cases they had the card and pulled the number to them. With newcomers, I try to use as much TPR as I can to lessen the stress of speaking unless it's a directed repetition. 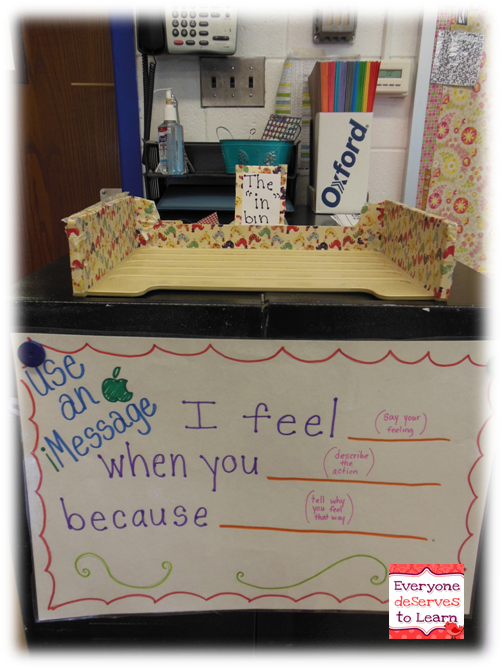 For one of my higher proficiency students, I introduced the sight word "is." He was able to tell me "4 is more. 1 is less." We use our fingers to point to the words in the order they need to go in the sentence. 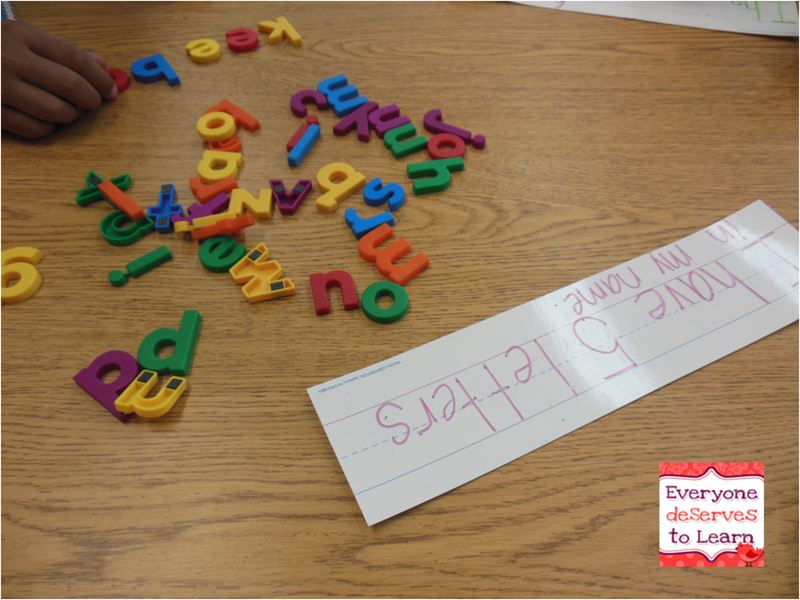 We arranged the manipulatives on the table to form the sentence as well. I then had him write his sentence in his journal. Next up in math, I'm going to attempt odd and even! I think I can do it...What do you do when you have to move on but your students are lacking in basic foundational skills? Any advice is appreciated! This week I began teaching 4 of my Burmese newcomers- 2 of them have never been to school before and two of them went to "school" in the refugee camps where they were born. When I tested them for their entrance test, I gave them sight word and alphabet tests- one student could read /the/, /is/ and /a/. The others have no letter-sound correspondance, and the two who went to school can count out loud to 10 but don't recognize the numerals or number words. Did I mention they are in 2nd, 3rd, 4th, and 7th grade? So! Where to start? After getting some great ideas from Mr. Greg at Kindergarten Smorgasboard and Cara at First Grade Parade, I decided to make our first week a focus on names, ABC's, and numbers. We've been practicing our alphabet every day and numerals to 120. I plan to start a number of the day soon, as well as letter-sound (using Wilson cards) next week. We learned to answer "What is your name?" and then we learned to spell our names out loud. We used the letter magnets to count how many letters were in our names. 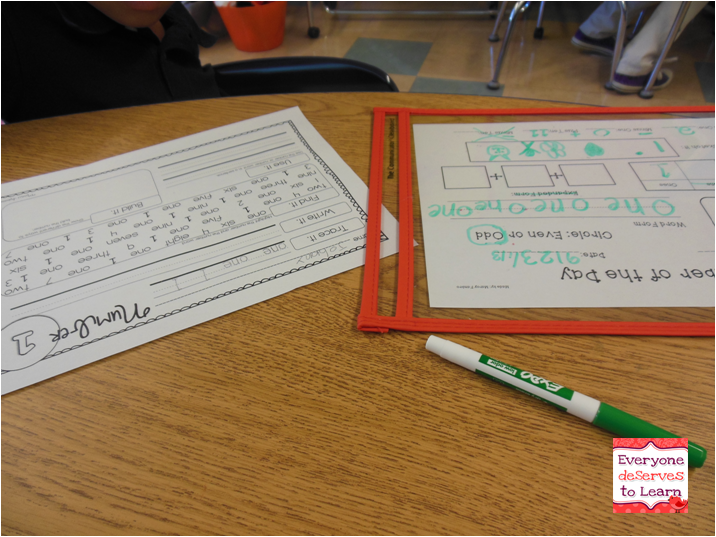 We wrote the sentence frame "My name is ____. I have ____ letters in my name." in our journals. 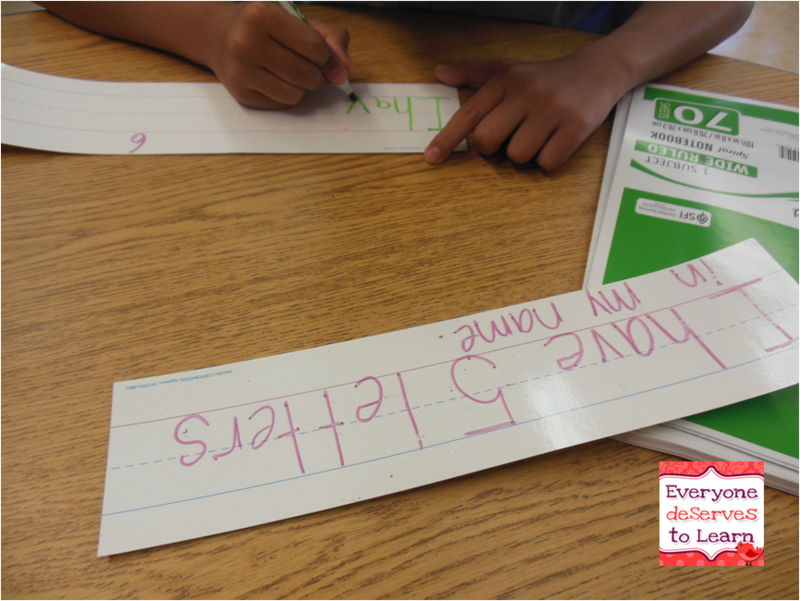 Some of my friends have trouble forming letters, so we will do some tracing and handwriting practice next week. These past few days were really an ongoing assessment for me to see where they are in terms of needs! We graphed our names and learned the word "more." In hindsight, I moved a little too fast- my students need work understanding the number line and counting using manipulatives. We'll probably do skip counting and place value. You live and you learn! This is a fun game called "Stomp the Number." 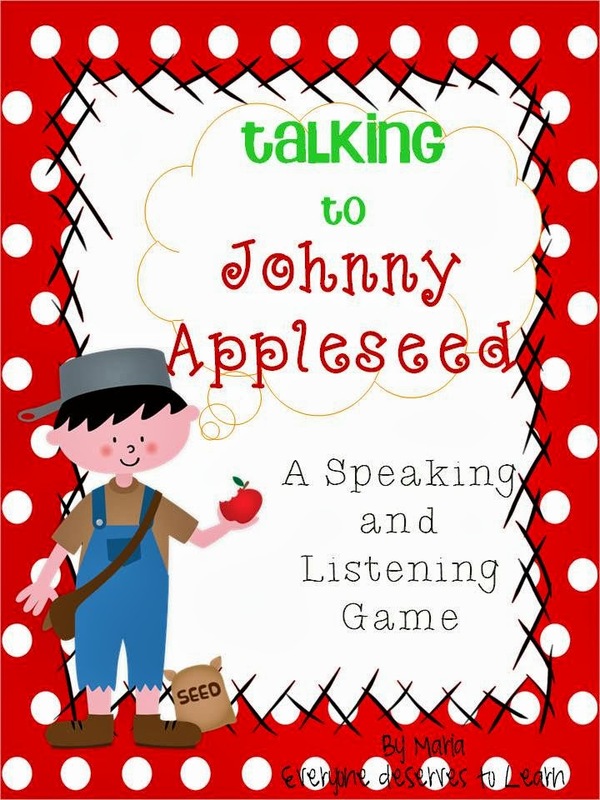 I played it when I taught French, and brought it back to teach my newcomers. It takes the values of TPR and brings in some competitive spirit. The seated version starts like this: we start with number cards, and I hold up the card, say the word, spell it, they repeat. Then I hand the card to a student. I pull the next card, say the word, spell it, they repeat. Then I teach them how to point to a card when I say the name. So after I teach a new card (3 at a time) I hand the card to a student and ask them to respond by pointing to the card I say. Confusing? I'll take pictures next time. 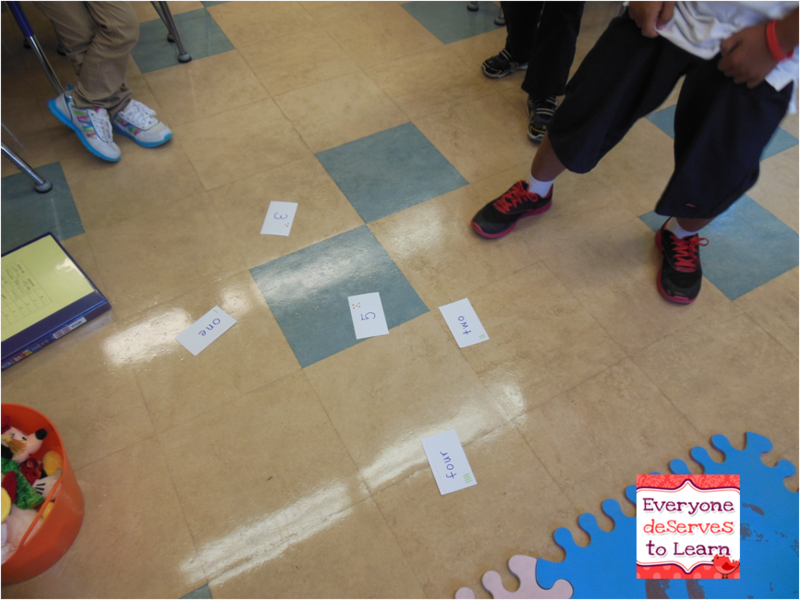 For the standing version, I review each card as I put it on the floor, then I call out a card and students race to stomp the card. Towards the end of the game, I pointed to a number on the number line and had one student call it out for the others to race to. We have a lot of work ahead of us! I am planning to work hard on getting their numerals and number word sense down in the next week or so- it will be so important for them to have basic math understanding especially since they are a little older. 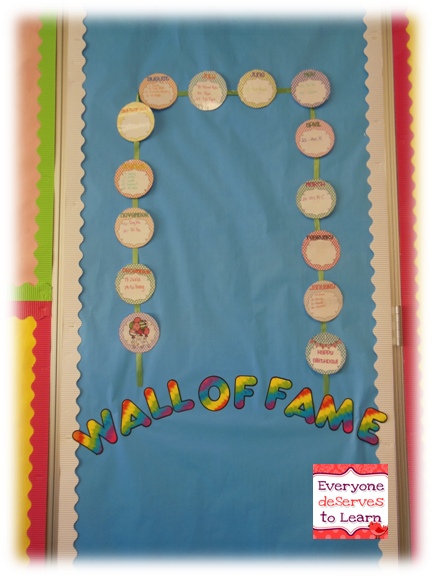 I will try hard to put a math spin on most things that we do, just like the name/number graphing. If anyone has any suggestions for basic math activities for older students, please send them my way! This school year has brought 5 brand-new Burmese refugee students to my school, as well as several other ESL students; we are expecting one or two more in the coming weeks. I've been testing my newcomers using W-APT, IPT, or some combination of both, based on ability, and what I've come to realize is how different the experiences in refugee camps can really be. For example, I have a second and third grade brother and sister who have never seen the alphabet and cannot count to 10, but repeat everything I say, yet I have a 4th grader who can write his name and write in Burmese, who I haven't heard speak a word. 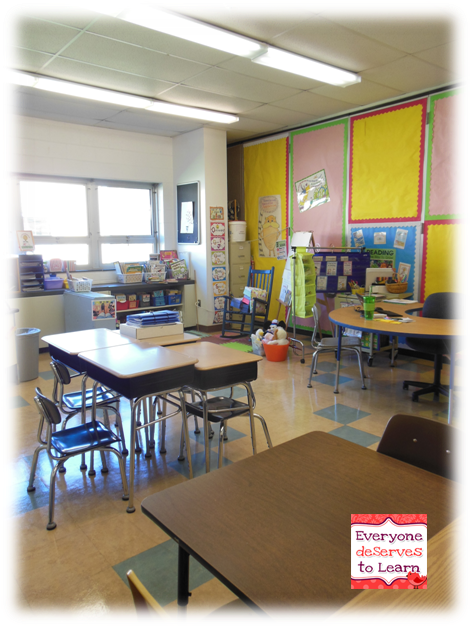 This is very difficult for mainstream teachers whose classes these children sit in all day, as they are trying to keep up with demands for SGO's and SGP's and Danielson!, and don't have either the time, know-how, or resources to differentiate for a student who is four grade levels behind in every content area and can't tell you his name. 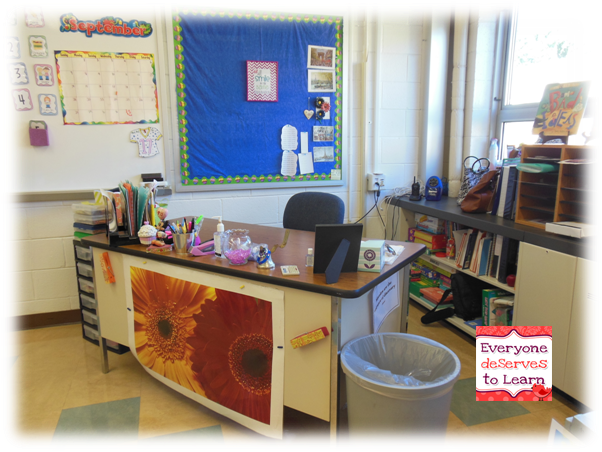 I went around the school on the first full day, taking pictures of necessary items, like the bathroom, the water fountain, me!, my teaching partner, the nurse, and a few other things. Then I labeled them and laminated them. My second grader keeps hers in a little ziplock- she carries it around everywhere! It's the cutest thing. She knows now that all she has to do is bring her card to the teacher, and the teacher will understand. Eventually we will work on repeating the word on the card, and then the sentence on the card, but right now I just want to associate the procedure of "asking" when she has to go somewhere with a positive experience. For someone who's never been to school before, that's a big step! I knew some teachers were having a really hard time with lunch count, so I added some general pictures of food. My teaching partner then went and found all of September's actual lunch menu (Asian stir fry, mac and trees) and printed those up too, but that's not pictured. 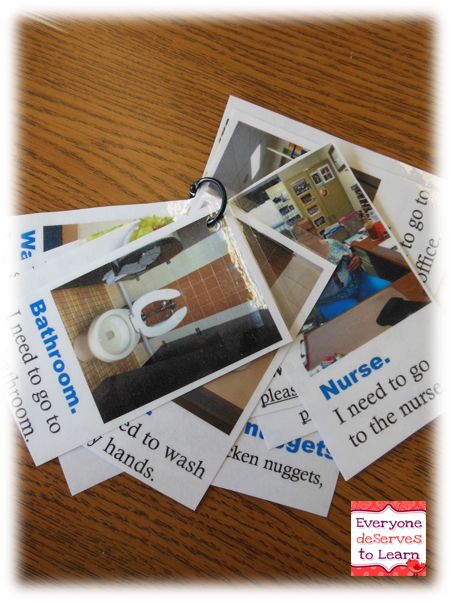 For my kindergarten newcomer, I laminated the cards the same way, but instead of putting them on a binder ring, the Kinder teacher and I decided to velcro a sentence strip to her desk and tape the laminated cards on there- sorry no picture! 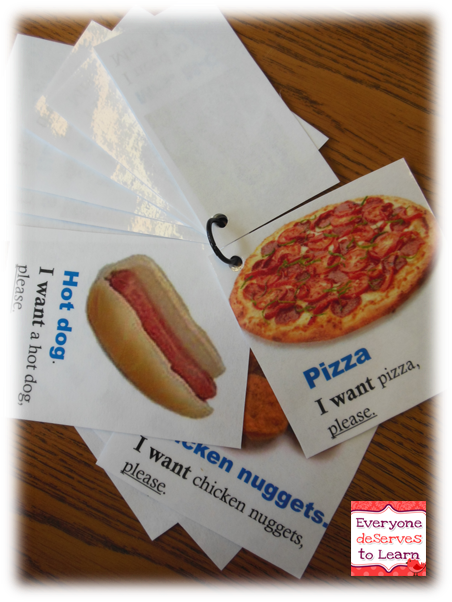 If you have students who are in their silent period, or students who are still learning crucial school vocabulary, consider making your own communicator cards! They took about an hour to photograph, upload, edit, and print. It's worth it to know that some of the stress of navigating the school day is taken away for both my students and the teachers I work with! What a week! We bought a house, I started my post-grad weeknight classes, and school began. Safe to say I'm a bit hard to track down! While I'm not pulling any students for ESL classes just yet, I am testing our newcomers (and we have a lot of them) and getting materials ready for all their different ability levels. Here's where I work! When you walk in, this is what you see. My horseshoe table (love it!) and my library. 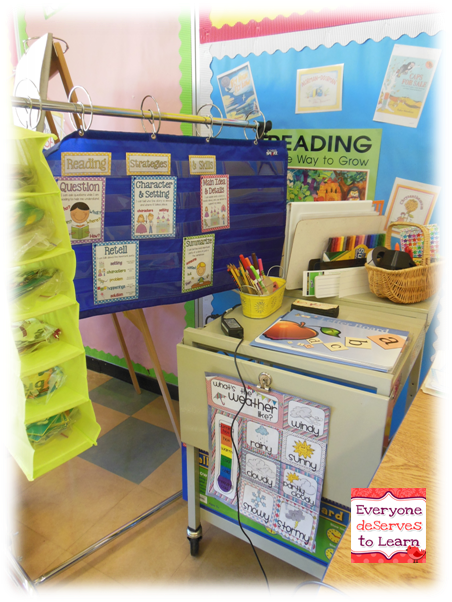 Next to my horseshoe table is a rolling cart with teaching materials for guided reading, my pocket chart with Teri's Reading Strategies on it, (the rest are behind on a binder ring) and my phonics sound cards in the shoe organizer. With Amy's help, I re-designed the layout of my library and reading area to accommodate my new furniture. Now my reading buddies have a place where kids can get to them, and my left-handedness can still write (somewhat neatly) on the easel. As for the library? Well, I got a box of books from Books by the Foot and have yet to fit them all in to my bins. 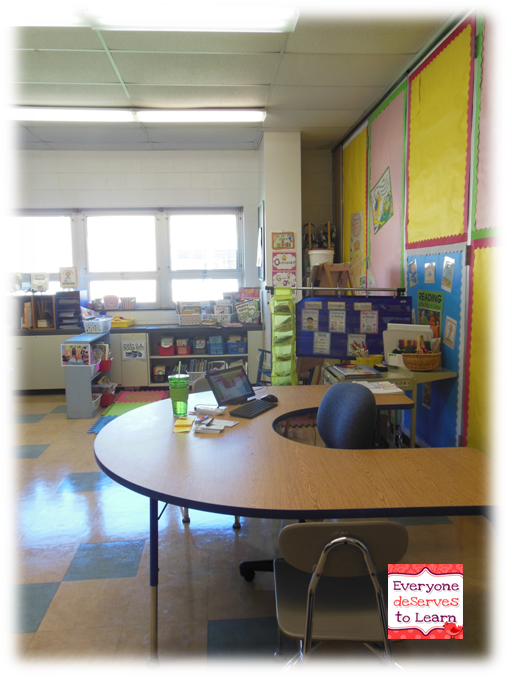 Here's my teacher desk, which I quickly realized I don't need, since I have the horseshoe table now. The only reason I keep it is because I have no closets and two shelves- the ones you see in the picture. Just a view from the Fountas and Pinnell side of the room. Yes, my back wall is still pretty blank. No, I'm still not sure what to do with it! Here's my birthday poster/circles and my Wall of Fame- I'll put student work under the Wall of Fame and a Student of the Month in the space between the birthdays. On your way out, put your papers in the "in bin" that I prettied up with some washi tape- it has roosters on it! By accident I put them upside down. Oops. I'll switch out the iMessage chart with whatever seasonal poster/anchor chart we're using at the moment, and I have some space under it to put two up at the same time. My phone is by my door, not by my desk- it's quite comical to see me sprinting across the room to answer my phone...I sure get a workout during the day! I hope you've enjoyed your tour of my classroom! 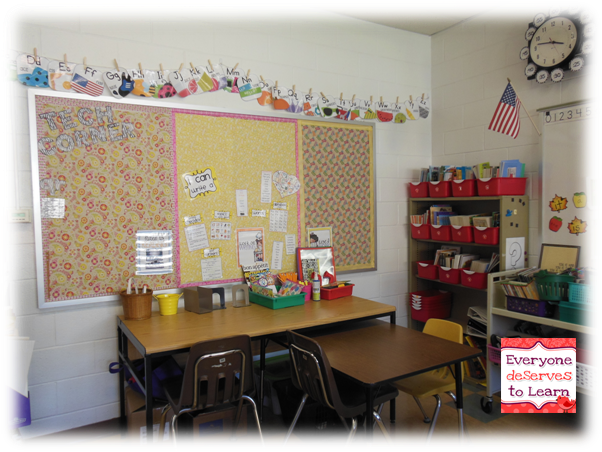 I loved seeing everyone's room all done up and got so many great ideas and inspiration from great teacher-bloggers out there.